TheBathOutlet has teamed up with CureSMA to raise awareness of the number one genetic cause of death for infants. CureSMA is dedicated to the treatment and cure of spinal muscular atrophy (SMA) -- a disease that takes away a person's ability to walk, eat, or breathe. Since 1984, CureSMA has directed and invested in comprehensive research that has shaped the scientific community's understanding of SMA. We are currently on the verge of breakthroughs in treatment that will strengthen our children's bodies, extend life, and lead to a cure. CureSMA has deep expertise in every aspect of SMA -- from the day-to-day realities to the nuances of care options -- and until we have a cure, we'll do everything we can to support children and families affected by the disease. Learn more about how you can help us reach a treatment and cure at www.cureSMA.org. 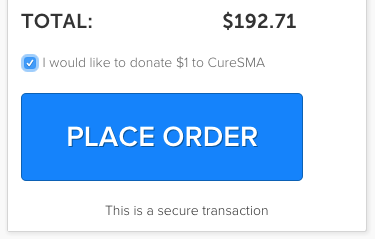 Join our fight against SMA by donating $1 to CureSMA. It's really easy and can be done on the final page of your transaction: just check the checkbox right above the "Process Order" button. ** Please note that donations are non-refundable on returns or cancelations.